In celebration of the Headley-Whitney Museum’s 50th anniversary, a special exhibition called “Convergence” is on display this summer. 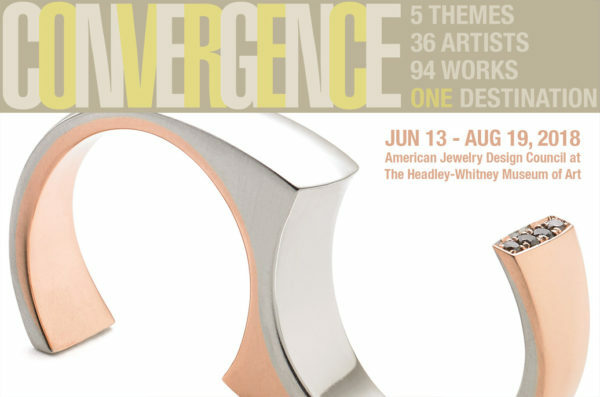 The show features work by the esteemed American Jewelry Design Council, of which Adam has been a member since 2011. We’re proud to announce that two one-of-a-kind works by Adam will be included in the show. For 25 years, AJDC members have participated in an annual design project based around a single-word theme. Once a year’s theme is announced, each of these elite jewelers will make a unique interpretation of the word and create a one-of-a-kind work representing the theme in their distinctive style. 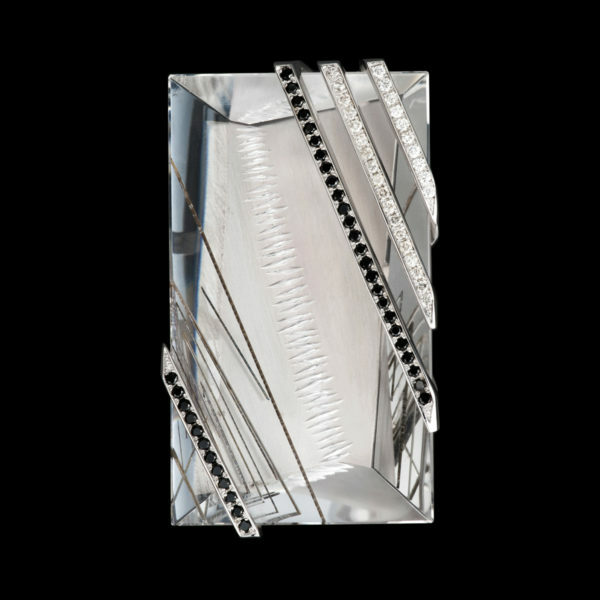 The resulting works of jewelry prove the annual project’s success at stimulating exciting and unique design by some of the most talented modern American jewelry designers. Drawing on decades of design project work, curator Amy Gundrun Greene elected to display jewelry art created by AJDC artists for the following five themes: Fire, Ice, Stripes, Wave, and Transformation. Two Adam Neeley originals will be on display: Inferno and Stripes. “Gemstones have always captured my curiosity. 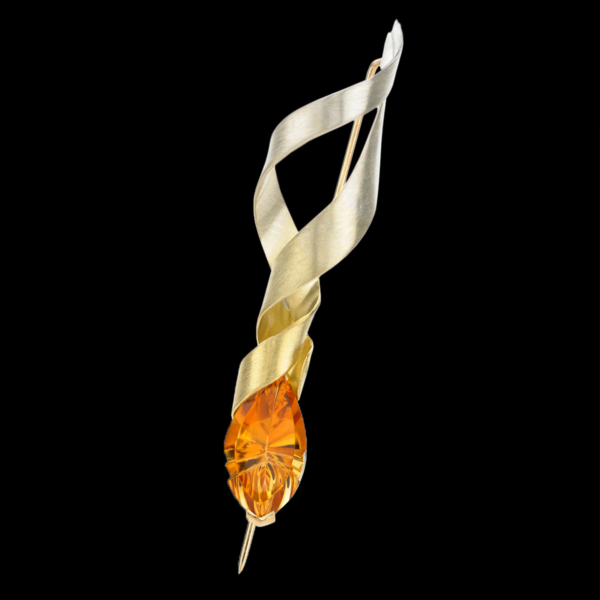 This stunning, fantasy-cut golden citrine by lapidary Lew Wackler was the spark of inspiration for Inferno pin. When I encountered this exceptional gemstone many years ago, I had no particular project in mind, but I felt certain that I needed to bring it home. When ADJC announced the design theme “Flame,” this dazzling gem came to mind immediately. To me, a flame conveys warmth and light. Whether at a campfire or a candle-lit dinner, a flame beckons loved ones to gather, to share stories, and to be nourished in each others’ company. The flame is also a powerful symbol of creation. In ages past, alchemists used flame as they sought to forge treasure from base metals. Metalsmithing is more about craftsmanship than mystery these days, yet I do feel a certain magic when I use fire at the bench to bring forth jewelry that is greater than the sum of its precious parts. Adam created “Stripes” as a part of the 2016 AJDC annual design project for the theme of the same name. This stately lapel pin showcases a quartz with needle-like tourmaline inclusions. Accentuating this gem’s natural texture is a phenomenal fantasy cut by world-renowned lapidary Tom Munsteiner. This unique gemstone brought Stripes to mind for Adam, making it a perfect fit for the AJDC project. 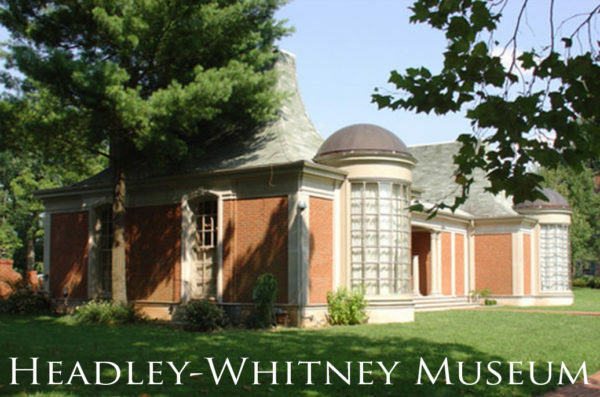 The Headley-Whitney’s is a perfect setting for showcasing these jewelry treasures. The institution has a proud history of celebrating jewelry as art. One of the museum’s founders was a jewelry designer: George Headley. Headly began his career in New York City and later relocated to Los Angeles where he worked as a jeweler to the stars out of the Hotel Bel-Air. Upon return to his native Lexington, KY Headley’s focus shifted to precious Objets d’art called Bibelots. He ensured his legacy of promoting jewelry as art continued through the ages when he and wife Barbara Whitney founded the museum in 1968. The exhibition Convergence is on display daily, now through August 19th, 2018 at the Headley-Whitney Museum located at 4435 Old Frankfort Pike in Lexington, KY. For more information, visit the museum’s website. Adam is honored to be a part of this incredible show. We urge any who will be in the area to visit! Updike, David. The AJDC Design Project: A Living Collection. The Headley-Whitney Museum of Art, 2018. To ask a question about a one-of-a-kind jewelry, submit this form and we’ll respond promptly.